The chance to travel across the world is an experience that one will not forget any time soon. The chance to represent your country playing the game you love is a memory that will last a lifetime for any player. Three Danville Dans, from Kansas University, rejoined the team on Saturday after this experience. Steve Washilewski, Jonah Ulane, and Mateo Zunica are rejoining the Dans after representing team USA in the 2018 World University Baseball Championship in Taiwan. Team USA finished its time in Taiwan with a 3-3 record, making it all the way to the bronze medal game where they lost to Korea 7-4. The returning players could very well put a spark in a key part of the season. In four starts this summer with the Dans, Washilewski was 4-0 with a 1.82 earned run average. Washilewski was fresh off a combined no-hitter and pitcher of the week award leading up to his departure. “I’m just trying to keep the momentum going from the first part of the season. I have to keep going strong. I need to hit my spots and keep it going strong into the playoffs,” said Washilewski. In two games in the World University Baseball Championship, Washilewski had an 0-1 record in two starts, with a 5.40 ERA. Despite different results in Taiwan, Washilewski looks to become a productive piece for the Dans again. Upon arriving back at Danville Stadium, Washilewski discovered he no longer had possession of his Dans belt. He suspected a teammate had taken it. Not only does the Dans starting rotation improve with the arrival of the new players, but the Dans got a piece of the bullpen back. Ulane was a regular out of the bullpen before the Championship. He sported a 1-2 record with a 3.44 ERA in 12.2 innings pitched. Like Washilewski, he was not in peak form while in Taiwan. He struggled in 5.2 innings with a 9.53 ERA. The top of the lineup also receives a productive piece of the order back in Zunica. He held a .271 batting average in 19 games with 16 hits and six RBIs. Zunica sported a .222 batting average while in Taiwan. “I thought myself and the guys brought good energy and it was a little taste of what we had to work on in the fall and we will get ready in the spring,” said Zunica. While three Kansas players left Danville, four came back. Jared Padgett joined his Kansas teammates in Danville. Padgett, a right-handed pitcher, did not pitch while in Taiwan. He was recovering from an arm injury but is ready to pitch in Danville and is looking to make an impact. The experience was a once in a lifetime trip for these players, but there were varying responses. While their teammate had a slightly different response. Unfortunately for the Kansas players, they were unable to play in their first game back against the Springfield Sliders. Former Bismarck-Henning standout Dylan Dodd continues to be a thorn in the side of the Danville Dans. On Thursday night, Dodd was roughed up for eight hits over 5.1 innings, but he didn’t walk a batter and he struck out six while allowing just one unearned run. And while the left-hander, who is headed for Southeast Missouri State, didn’t figure into the decision, he certainly helped Hannibal snap Danville’s three-game winning streak as the Hoots claimed a 2-1 victory in a game halted in the seventh inning by the weather. Hannibal second baseman Josh Lane provided all the offense for his team. In the fourth inning, Lane gave the Hoots a 1-0 lead on a two-out RBI single that scored catcher Sam Nozicka, who was hit by a pitch to start the inning. Danville (26-20) came back to tie the game at 1-1 in the top of the fifth. Ben Bianco got the inning started when he reached on a error by Hoots third baseman Joe Roscetti. With two outs in inning, Danville designated hitter Kobe Kato delivered an RBI single to score Bianco. The Dans would loaded the bases when Cade Evans reached on a single, but Dodd got Gavin Dugas to fly out, ending the inning. In the bottom of the sixth, Hannibal scored the eventual game-winning run on a two-out, RBI-single by Lane. Danville right-hander Slate Fuller took the loss for Dans, while Brendan Saak, who came in relief of Dodd in the sixth, earned the victory. The Dans are off tonight before hosting the Springfield Sliders at 6:30 p.m. Saturday on Poster Night at Danville Stadium. In other Prospect League news, Danville right-hander Matt Gammon, a sophomore-to-be from Southeaster Illinois, was named the pitcher of the week. Gammon appeared in two games for Danville, allowing just to hits, walking none and striking out nine. He is 4-0 with a 0.29 EAR in 12 appearances on the mound and he has struck out 32 in 30.2 innings. Steven Washilewski and Blake Schilleci have also earned Pitcher of the Week honors from the Danville Dans. Every manager looks good when his team scores double digits. So far this summer, the Danville Dans are 5-0 when they score 10 or more runs in the Prospect League contest. The latest offensive explosion came Wednesday night at Clemens Field as Danville parlayed 13 hits into a 13-1 victory over the Hannibal Hoots. Danville’s duo of Noah Beason and Will Klein combined to hold Hannibal to that one run on three hits, as Beason went the first six to get the victory, improving to 1-0; while Klein finished off the final three frames to pick up his first save of the summer. And, while the pitching was important, Danville has won three straight behind an offense that is averaging 9.7 runs per game, 11.0 hits per game — including 4.7 extra-base hits per game. “The key has been staying consistent at the plate and hunting fastballs,” Coleman said. “It’s the same thing that we’ve been talking about from the first day of the summer. Leading the way on Wednesday night was second baseman Gavin Dugas, who went 3-for-3 with three runs scored. Dugas, an incoming freshman this fall at Louisiana State, is six for his last 16 at the plate and he has scored eight runs in the last five games for Dans. Joining Dugas with multiple hits on Wednesday was designated hitter Kobe Kato, who had three to bring his team-leading batting average up to .351, while catcher Ben Bianco went 2-for-5 as he is 12-of-34 (.353) in his last eight games for Danville. With the Quincy Gems sweeping the Terre Haute Rex on Wednesday night, the Danville Dans find themselves just 1.5 games out of first place in the Prospect League’s West Division. Coleman pointed out that Danville will likely get all three Kansas University players back this weekend from their trip to Asia, representing the United States of America. 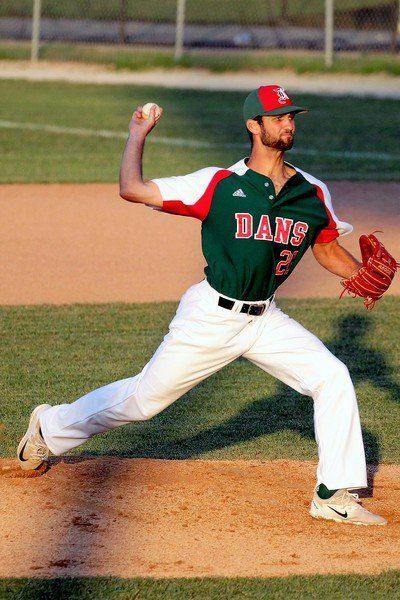 Danville will face former Bismarck-Henning standout Dylan Dodd for the fourth time this summer tonight as the Dans and Hoots wrap up their two game series at Clemens Field. Dodd is 2-0 with a 1.50 ERA against Danville. The left-hander has 30 strikeouts and just one walk in 18 innings against the Dans. 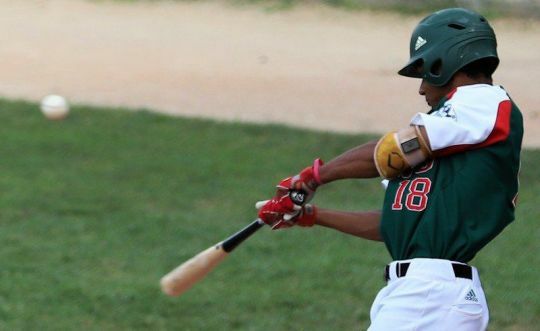 The hopes of winning the Prospect League’s West Division title for the Danville Dans could swing greatly over the next four games. Actually, things swung quite a bit on Friday night, in the first of three matchups between the Dans and the first-place Terre Haute Rex. Danville overcame a 6-0 deficit, scoring in each of the last four innings including a four-run ninth, as the Dans defeated the Rex 8-6 before 1,068 at Bob Warn Field in Terre Haute. “This was a big win,’’ said Danville manager Eric Coleman, whose team is now just 2 games behind Terre Haute for the division lead. “We just kept battling and chipping away. I think this game was a great sign of the character that this team has, because they never gave up. The ninth inning rally for the Dans was started by Thursday’s hero Ben Bianco, who drew a leadoff walk and then advance to second on a wild pitch. Shortstop Trevor Minder drove him home with a single allowing Danville to pull within 6-5. After a sacrifice bunt by Christian Sanchez and back-to-back walks to Jacob Talamante and Kobe Kato loaded the bases with one out. From there it was a combination of speed from the Dans and fielding miscues by the Rex allowed Danville to tie the game at 6-6 and take a 7-6 lead. Zach Huffins drove home the first run on an error by Terre Haute shortstop Lorenzo Elion and that was followed by Gavin Dugas getting an RBI on an error from Terre Haute first baseman Jarrett O’Leary. The Dans capped their four-run inning on an RBI groundout from Damian Pierce. Terre Haute closer Thomas Waning, who also gave up a game-winning hit on Tuesday to Trevor Minder, was saddled with all four runs — two earned. “We put the ball in play and we made things happen in the ninth inning,’’ Coleman said. After a doubleheader on Thursday, including a 12-inning affair against Hannibal, the Dans were extremely limited in their bullpen options. So, Coleman used a pair of position players for the final three innings. Cade Evans threw scoreless seventh and Drew Bianco picked up his first collegiate victory with a scoreless eighth and ninth innings, but he needed a little help for those final two outs. Terre Haute loaded the bases with one out in the ninth, but Bianco got Elion to hit into a game-ending double play. It was the second twin killing of the night for the Dans. Ben Bianco grew up in a college baseball family. His dad is Ole Miss coach Mike Bianco, who just completed his 17th season with the Rebels. But as an incoming freshman to University of Louisville this past fall, Bianco admitted that he got humbled facing collegiate pitching for the first time. That’s one of the main reasons that he was looking forward to this summer with the Danville Dans. On Thursday night, Bianco extended his hitting streak to four games as he went 2-for-2 with a single, a double and two runs scored in the Dans 3-1 victory over the Hannibal Hoots in the first game of a Prospect League doubleheader before 857 at Danville Stadium. The second game was tied 1-1 in the 12th inning when the Commercial-News went to press. “It’s nice to start feeling better in the box and getting my timing back,’’ said Bianco, who is 6-of-14 during his hitting streak. Why does he think that he is hitting better? Bianco started his night with a one-out single to left. After an opposite field hit by Jacob Talamante, Bianco scored on a RBI double down the left-field line by Zach Huffins. It was a very similar scenario in the fourth inning. This time Bianco led off the frame with a double to left center and this time he scored on a run-scoring ground out by Huffins, breaking a 1-1 tie. With two RBIs on Thursday, Huffins now has 11 on the season in 36 games. “It’s not really a big deal,’’ Huffins said. “I just try to put our team in the best position possible and try to capitalize on my opportunities. Bianco started his summer going 0-for-15 for the Dans, before going 2-for-4 with a home run in Springfield, Ohio, against the Champion City Kings. After Danville’s game with the Lafayette Aviators on July 4, Bianco was hitting just .136 with 2 homers and 4 RBIs. Since then, he is hitting .429 with 2 RBIs and 2 runs scored. “It’s been a grind, but that’s why I came here,’’ Bianco said. “You come to the Prospect League to get a lot of at-bats, play a lot of baseball and get yourself better for when I get back to school in the fall. Did he even feel that way during some of his struggles? “That happens in baseball,’’ he said. “You just have to flush every at-bat after it’s over, and keep going forward. You need to go to the plate each time with a clean approach. 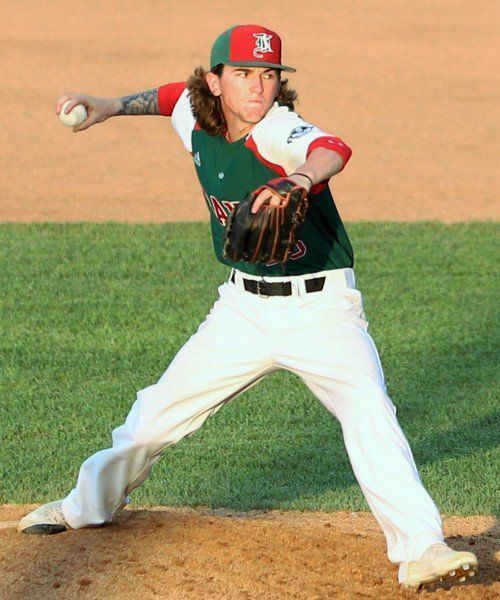 In Thursday’s second game, former Bismarck-Henning standout Dylan Dodd, the 2016 Commercial-News Player of the Year continued his mastery of the Danville Dans, going six innings, allowing just two first-inning doubles, while striking out a summer-best 12 for the Hannibal Hoots. Dodd has struck out 30 and walked just one in 18 innings against the Dans this summer. The only run that Danville got off Dodd came on a run-scoring double by Gavin Dugas. Hannibal sent the game into extra innings when Chris Iazzetta scoring on a seventh-inning wild pitch. The two team remained tied into the 12th inning. Whether you think it was the baseball Gods or the home-field advantage, Trevor Minder’s eighth-inning ground ball turned into the game-winning hit. Minder, who drove in all three runs for Danville, delivered a two-out, two-run single off of Terre Haute reliever Thomas Waning giving the Dans a 3-2 victory over the first-place Rex before 3,412 at Danville Stadium. Coleman was suspended two games for his part in the benches-clearing altercation on Monday night against the Quincy Gems. Rick Fraire, the manager of the Gems, was also suspended two games, while Quincy’s Riley Pittman received a one-game suspension. That was also the rally cry from the players. Minder admitted that he was excited about the opportunity to hit with two out and the bases loaded in the bottom of the eighth. “It’s fun having that opportunity to give your team the lead,” he said. “I knew he was going to come into the zone, so I was trying to be aggressive, put the ball in play and not try to do too much. Actually, the bad-hop grounder is one that Minder has seen before at Danville Stadium. In the first inning of Monday’s game against Quincy, he had one of those bad hops come up and get him in the shoulder and before the game, he almost took one in the face. “I’ve learned that you have to play for hose hops on this field,” Minder said. “When I saw it was hit right at (their shortstop), it didn’t look good, but we got the bounce. Connor Taylor, a former standout at Salt Fork and at Danville Area Community College, wound up taking the hard-luck loss for the Terre Haute Rex as both Gavin Dugas, who reached on a hit-by-pitch, and Damian Pierce, who singled, were his responsibility. Tuesday’s contest was the fourth 1-run game between the rivals for the Branch Rickey Cup, as the Rex still lead the season-series 6-3 over the Dans. Schilleci, who was the Pitcher of the Week in the Prospect League, struck out five and walked one during his outing. But, he also admitted it wasn’t the same with Coleman. Erie pointed out that Danville just missed having another game with double-digit hits. The Dans had nine hits in the contest after racking up 10 or more hits in four of their last five contests. After a grueling stretch of 13 games in 12 days, the Danville Dans finally get a day off on Wednesday. They being a stretch of 10 games in eight days on Thursday with a doubleheader against the Hannibal Hoots at Danville Stadium. First pitch is set for 6 p.m. Temperatures were already high on a hot, muggy night at Danville Stadium. 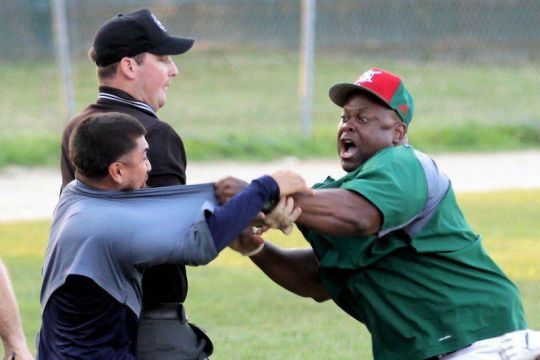 But, things got really hot in the fourth inning as both Danville manager Eric Coleman and Quincy manager Rick Fraire ignited a bench-clearing brawl. Quincy, which scored 13 runs in the first two innings, held on for 13-8 victory over Danville in front of 478 fans on Bark in the Park 2.0 Night. It started when Danville reliever Nicola Mislinski hit back-to-back guys to start the fourth inning. That prompted home plate umpire Lance Walsh to issue warnings to both teams. After few chest bumps between the two managers, the action escalated to pushing, shoving and a few punches that didn’t land as base umpire Augie Farwig attempted to separate the managers. Both teams came out of their dugouts, as Quincy assistant coach Matt Crook, a former standout at DACC, held back Pittman. Once the dust had settled, both Coleman and Fraire, who was an assistant coach with the Dans in 2013, were ejected along with Pittman. “We have each other’s backs. We’re a family,’’ Coleman said. Unfortunately for Danville, the damage had already been done. Quincy sent 22 batters to the plate in the first two innings against Danville starter Stewart Currie. The Gems scored 13 runs on 12 hits, including a pair of 3-run homers. Jimmy Huber’s blast capped the six-run first inning and Bailey Montgomery’s homer was part of a seven-run second. Mislinski and Cody Hawthorne actually combined for seven shutout innings, holding the Gems to just three hits during that stretch. After trailing by as much as 11 runs (13-2), the Dans nearly got the tying run to the plate in the ninth as they left the bases loaded. The comeback started in the bottom of the fourth with a line-drive solo homer to left by Blake Paugh. The home run was the seventh this summer for Paugh and his second in as many nights. Danville had double-digit hits for the third straight game and four of their last five. Danville is back at home tonight with a 6:30 p.m. contest against the Terre Haute Rex. QUINCY — Trevor Talpas pitched 1.1 innings of shutout relief to pick up his first win this summer for the Dans. Johnny Ray got the final four outs to pick up his second save. Offensively, Kobe Kato and Trevor Minder, batting first and second, each finished with two hits as did Jacob Talamante, out of the No. 9 hole. Gavin Dugas, who had missed 10 games going through the concussion protocol, went 1-for-5 with an RBI in his return. Blake Paugh blasted his sixth home run of the season. Key players — Shortstop Jimmy Huber went 3-for-6 with 5 RBIs for the Gems.